...experience gained from the operation of a microhydro plant, probably of interest mostly to other Powerspout owners. At the start, there was much to write about but now (March 2019) it has been operating for 6 years there is less. So new posts will only be written if something interesting comes along. 5.36mm jet delivering 0.63 l/s to the pelton which is rotating at 870 rpm and generating 127 watts into the grid. EcoInnovation, the company in New Zealand making Powerspout turbines, has developed a new jet nozzle. It's longer and more tapered than the original and the change in design slightly changes the way the nozzle performs. There is a theoretical flow an ideal nozzle will deliver which is dependant on the orifice size and the pressure head. 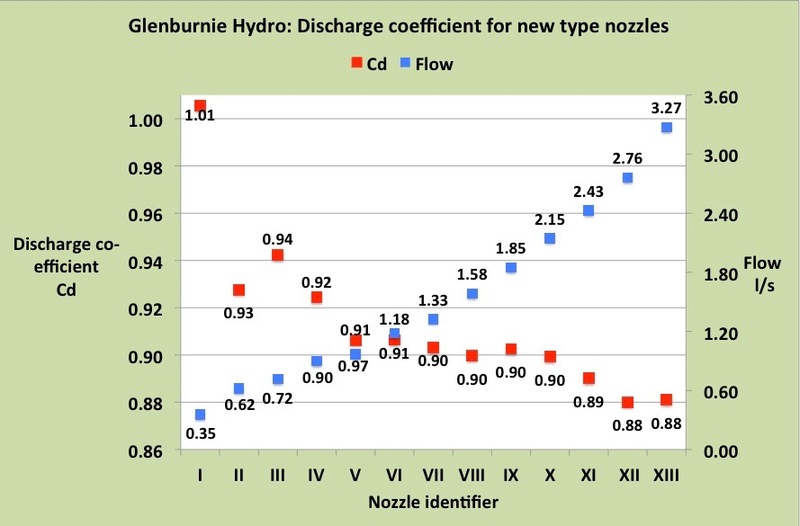 However in the real world the actual flow is less than the ideal by a factor called the Discharge Coefficient (CD), and it was the CD for the new nozzle which needed to be measured. This is how it was done. 1. 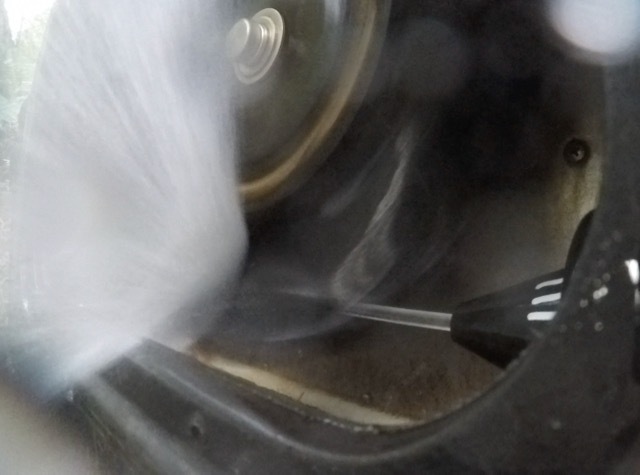 The formula* for determining CD requires net head to be known, - net head being the water pressure at the entry to the nozzle when it is operating. The very large pressure gauge in the picture, calibrated in metres head of water, provided the means for measuring it. Plumbing it to the manifold required the temporary removal of the upper pelton jet. 2. The formula also requires the flow through the nozzle to be known. This was determined by measuring with a stop watch the time it took for a defined volume of water to pass through the orifice. This defined volume was 429.5 litres. It was known to be this because a drop in water level in the header tank of 104 mm could be calculated to be equal to this volume. The height drop of 104 mm was determined by two knitting needles set exactly with their points that distance apart. The stop watch was started when the surface tension 'grab' to the upper needle was broken and was stopped when broken again at the bottom needle. The inflow of water to the header tank was diverted while each measurement was made. The measurement time varied between 131s for the nozzle with the largest orifice and 20m 11s for the smallest. 4. As can be seen, the Discharge Coefficient is not the same for all sizes of nozzle. For the smallest size, nozzle I, where the flow is least, the CD is close to unity** indicating that actual flow is the same as would be expected from an ideal nozzle. But as orifice size increases, the CD falls. 5. The new type of nozzle performs better than the old. Old nozzles had a mean CD of 0.85 whereas the new 0.90. 6.The value of Discharge Coefficient for a nozzle depends on the pressure difference between the pressure of water entering the nozzle and the pressure once it has left through the orifice. 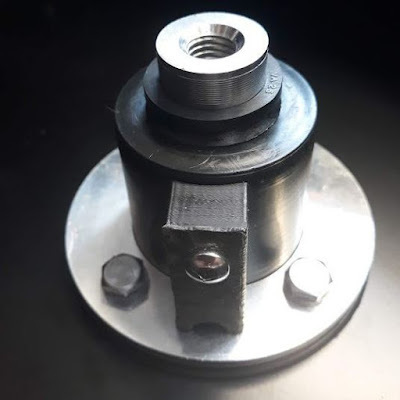 So although on my site (which has a pressure head of between 51.5 and 53.6 m depending on flow) the CD has been measured as indicated above, the same nozzle on another site with a different pressure head will have a different CD, though it won't be greatly different . ** The result obtained was 1.01, i.e. better than unity, which is not possible and represents experimental error. I've been experimenting recently with trying to stop wetness from the pelton side of the turbine creating dampness on the alternator side. There's a seal around the shaft which should prevent water in any quantity getting across but an investigation I've done using bags of silica gel indicates that in spite of the seal about 300mls per month still gets across. 3. Inspection after 3 weeks running showed the seal had badly scored the plastic face of the top-hat, presumably from softening of the plastic by the heat of frictional contact, - I must have applied it too tight to the face. 4. A friend who is skilled on his metal lathe kindly turned a stainless steel cap to fit over the plastic top-hat so the seal rubbed on metal; the cap is held on only by being a tight fit. 5. 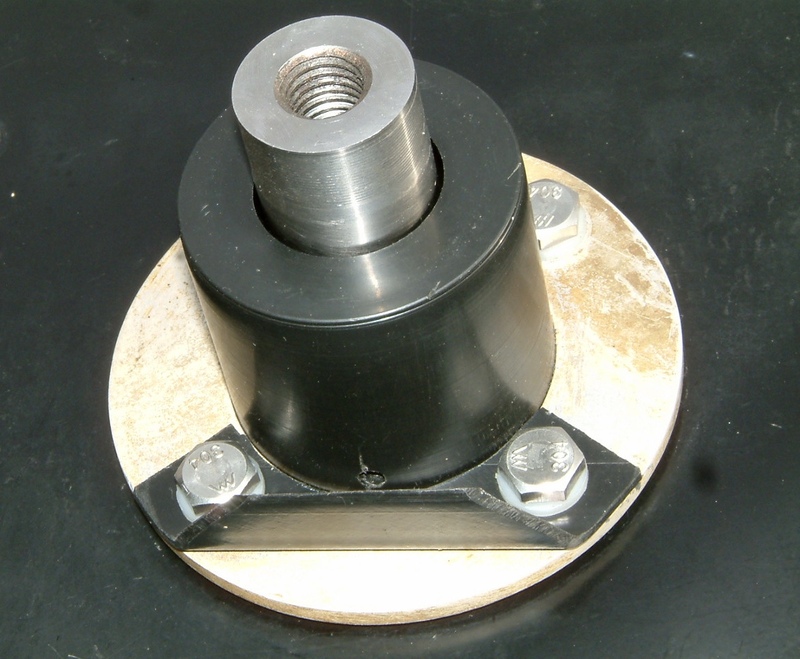 Suspecting that water might also enter the top-hat via its drain hole, a deflector was devised to shield the hole from the upward direction of water leaving the pelton from the lower jet. Only time will tell if it makes any difference. The early signs are that the silica gel bags do seem to be taking up less water but I'm yet to be convinced this is a genuine observation. Theirs is a neater solution but care will be needed not to apply the V ring seal too tightly against the face of the top-hat. The seal only needs to just touch. After observing the scoring illustrated above, a new top hat with the seal just touching ran for 3 weeks with not even a mark being caused. A smear of grease is also a good idea. In the UK, people who generate electricity can be paid for what they generate. The scheme is called the Feed-in-Tariff scheme (FiTs), - and next year it comes to an end. The end is on March 31st 2019. It comes to an end only for new schemes. Schemes already accredited, like mine, will continue to receive payments for the duration of the original contract, - 20 years. Feed-in-Tariff payment is made up of two parts: a payment for the total energy generated and a payment for the energy exported to the grid. Payment for both components ends. This change in government policy forces a re-think for those considering a renewable energy scheme: does it still make financial sense? The thrust of this blog post is to suggest that if the renewable scheme is very small hydro then there is still a strong case for going ahead. First, in years to come, the cost of electricity purchased from the grid will go up. If you generate it yourself, so the value of what you save will increase over time. Since the design life of a hydro is upward of 40 years, these savings will have many years to play out. Second, there is a benefit unique to very small hydros operating 24/7. Putting out power at the relatively low level of 500 watts (+/- 300), the turbine's output closely matches the base load demand of a property. Base load is made up of that multitude of appliances which are 'on' all the time - from battery re-chargers to fridges, freezers, central heating pumps, computers and so on. Totted up their power requirement can typically be 400 watts. That translates over a day to an energy consumption of 10 kWh. Purchased from the grid, day after day, week after week, 10 kWh per day amounts to a significant expense, but supplied from your own turbine what would have been an expense becomes a saving, - a saving which can be thought of as justifying the initial cost of the turbine. 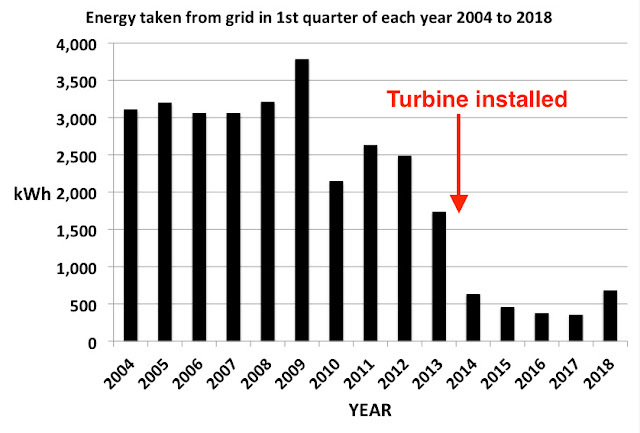 ... there is an unmistakeable step-down in kWh taken after the turbine was installed, - and this represents the saving made by installing it. (Incidentally, the increase seen in 2018 resulted from acquiring a Nissan Leaf in late 2017). The value of the saving in this one quarter is £350. For a whole year it is £546. So, whilst Feed-in-Tariffs may be ending, a small hydro can still pay for itself through the savings of offset. Certainly, without FiT's payments the time taken to recoup the cost of installation will be longer. With FiTs payments for me it has been 5 years. Without FiTs and keeping to 2018 electricity prices it would have been 16 years. So 16 years is about the period of time someone starting out in very small hydro after 31st March 2019 should be thinking of as the time it might take to recoup the installation cost. It seems a long time, but it could be shorter, perhaps much shorter if electricity prices really go through the roof. Transmission line: length 120 m of 4 core 2.5 mm² copper connected as 2 core 5 mm².